Prince Albert, SK – Two members of the Prince Albert Raiders found themselves on NHL Central Scouting’s Final Rankings that were released on Monday morning. Forwards Brett Leason and Aliaksei Protas were ranked 25th and 44th respectively among North American skaters. Leason enjoyed a breakout season in his first full year with the Raiders. The Calgary, AB product led the Raiders with 89 points (36 goals, 53 assists) and set new career bests in all offensive categories in just 55 games played. He also has three goals and nine assists through nine games in the 2019 WHL Playoffs. His accomplishments on the ice have put Leason in the spotlight as he suited up for Team WHL at the 2018 CIBC Canada Russia Series in November and Team Canada at the 2019 IIHF World Junior Hockey Championships in December. Leason is also a two-time recipient of the WHL On the Run Player of the Week award a two-time recipient of the WHL McSweeney’s Player of the Month. Protas moved up 33 spots from the midterm rankings as the Belarusian import was listed 77th in January. Since In his rookie season in the WHL, Protas recorded 11 goals and 29 assists in 61 games to lead the team in rookie scoring. The Vitebsk, Belarus product also has four goals and three assists in 10 games during the WHL Playoffs. Internationally, Protas represented Belarus at the 2019 IIHF World Junior Hockey Championship Division 1 tournament in December. 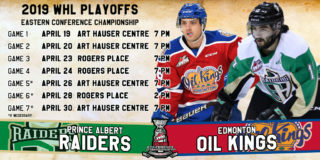 Leason, Protas, and the Raiders will continue their run in the WHL Playoffs on Friday night when they open the Eastern Conference Championship against the Edmonton Oil Kings at the Art Hauser Centre. Tickets go on sale for Games 1 and 2 at 9 a.m. on Tuesday morning at the Art Hauser Centre box office. There is a limit of six tickets per patron. Online ticket sales begin at 10 a.m.